Searching for a way to keep track or all your daily appointments and events? Use this Free Printable Daily Blank PDF Planner to track your time spent on daily tasks and projects. 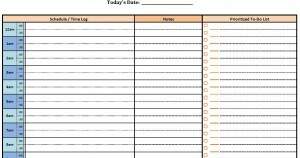 Print out this daily pdf blank planner and fill in your work details as the day progresses. Download this Free Printable Daily Blank PDF Planner on this page. The template can be downloaded instantly and printed for free compliments of MyExcelTemplates.com! Before filling out the body of the planner, simply jot down the date in the space reserved at the top. This planner is just one of hundreds of templates and spreadsheets available on MyExcelTemplates.com that are designed to make your life just a little bit easier!